I love grilled cheese. I mean, I really love grilled cheese. Something so wonderful about the buttery, caramelized bread filled with oozing velvety cheese stretching and pouring from inside. Brings back memories of childhood and everything in between. 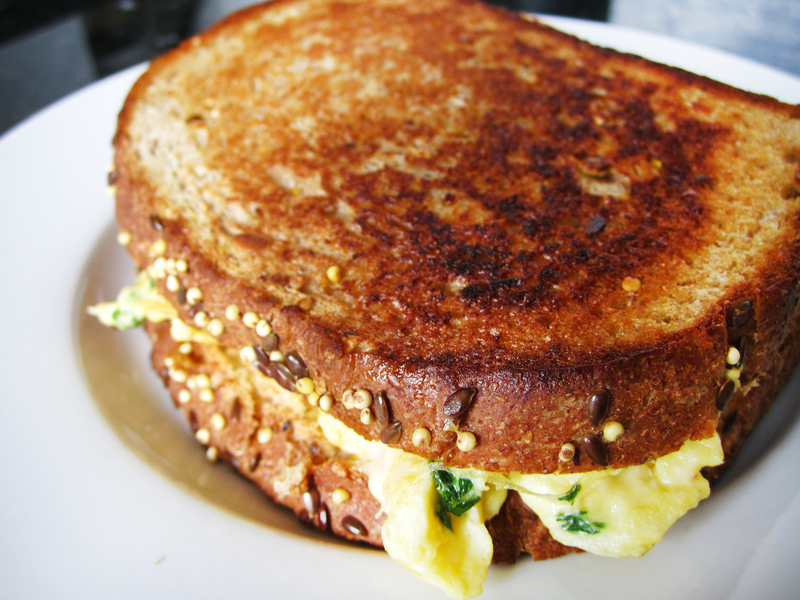 This is a little spin on the basic grilled cheese because, well, I love eggs too. This is a great sandwich when you need breakfast on the run, or just sitting down for a little TV time with comfort food. Blend 1 egg with some of the chopped cheese and parsley in a bowl. Drizzle a bit of olive oil into a skillet over medium heat. Once hot (just beginning to smoke), pour the egg mix into the pan. Fry like an omelette, not scrambled (cook until brown on one side, lifting the edge and allowing the wet mix to slide under every so often, then turn over entirely). Remove from heat and set aside. Drop half of the butter into a skillet (cast iron preferably) over medium heat and melt. Place one slice of bread, cheese slices to cover, then add the egg on top, more cheese slices, and the other slice of bread. At this point leave it alone. Let the bread become caramelized on the one side. Once ready, lift the sandwich with a spatula, put the rest of the butter in the pan, and flip over the sandwich onto the butter and caramelize. Perfect by itself but even better with a cup of cappuccino!